Le Bateau Ivre (French for the Drunken Boat), captures the struggles of sailing ships in the 1800s. Artist Alber de Matteis conveys a sense of adventure in this boat-sized sculpture made of galvanized steel finished with a bronze patina that reflects the framing and planking of a sailing vessel. The art piece is located in front of the picture postcard beach overlooking the marina. Learn: Did you know, boat building is one of the oldest branches of engineering? Gliding through the water – with or without a current – is all about effective design and construction. It’s how the Planing Plank, known as the backbone of a ship, works with other elements of construction to keep the boat right-side up and on course as it traverses distant seas. The frame of the boat, like ribbing, shapes the vessel. Traditionally, ship frames are made of wood, steel, aluminum or composite materials. They may be removed after construction to save weight or to be reused or abandoned. 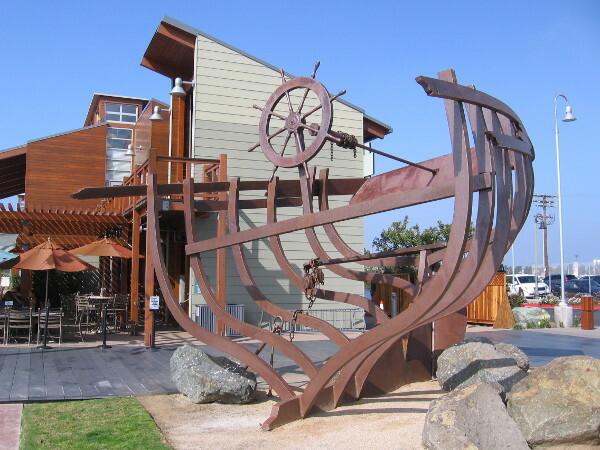 “Lofting” is the process used to transfer of a boat design to a full-sized plan. Technology now allows for pieces of the ship’s frame can be cut from a computer program by a robot with extreme accuracy. Quiz: Why is boat building an early form of engineering? How would you shape your boat to glide through the water? If you could design something that could be cut from a computer program by a robot, what would it be? Imagine you’re on a ship at sea in the 19th century. Sit in an oversized deck chair and survey the bay. Try to dangle your feet in the water. More: Sculptor Alber de Matteis has an affinity for working in iron. He values the material’s strength and flexibility, its ability to be transformed and shaped by fire. The original Le Bateau ivre is a 100-line verse-poem written in 1871 by Arthur Rimbaud. The poem describes the drifting and sinking of a boat lost at sea in a fragmented first-person narrative. It was considered revolutionary in its use of vivid imagery and symbolism.